So is there anybody out there who hasn’t heard the phrase “social media”? I’m sure that there a many excellent definitions available, but I’ll try to sketch out my own. It’s communication that is interactive. I guess well beyond two-way to, I suppose, infinite-way communication. It’s got that “social” word in it. It seems, at least to me, more like exchanging news, information, or gossip, over a cup of coffee (or a glass of wine), than like watching the news, reading the paper, or passively viewing television commercials. Oh, and it seems to be linked to the internet. At least I never heard of it before the the internet. So, I guess I’ll say social media is communication generated, updated and/or modified by multiple (perhaps infinite) sources and disseminated through that ubiquitous world-wide web. At any rate, the NDDC Communication Committee has long been discussing the 5,000 people who are part of our town for at least nine months a year, commonly referred to as college students, and who we don’t always seem to be successfully reaching. Sometimes when I’m talking with one of those Carls or Oles, it’s obvious that they have a rather limited understanding of downtown’s offerings. Committee members Dan Bergeson and Greg Kneser had a one word answer: Facebook. Now, because I realized a couple of years ago that my collegian daughters no longer seemed to use e-mail and stay in touch with each other and their friends through Facebook, I knew what they were talking about. Yeah, I’m on Facebook. So are almost 100 businesses in Northfield. Heck, I’ll betcha over half of the town is on Facebook. In fact, with 400 million users, the site’s current population would make it the third-largest country in the world, behind only China and India and ahead of the United States. Dan and Greg said it’s not just about the college students. There are who-knows-how-many people who once lived in Northfield and want to “stay in touch”. As our “friend” Maureen Valley said, “I love reading what’s going on in and around Northfield…I’m 1,500 miles away and miss the smallness and intimacy of Northfield”. Facebook is a social networking site. Social networking is just another way to build community. The NDDC is all about building our downtown community. 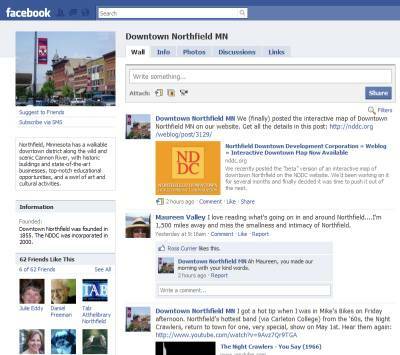 So, a couple of weeks ago, we put Downtown Northfield MN on Facebook. Check it out, hear what’s happening in Downtown Northfield, and join the party.